The Romantic Piano Concerto series continues to bring undiscovered works to the listening public, performed by the greatest piano virtuosos of today. The composer Hiller was admired by Schumann, who described him as the exemplar of ‘how to combine orchestra and piano in brilliant fashion’. One of the most imposing musical personalities of the nineteenth century, close friends with the likes of Rossini, Liszt, Berlioz and particularly Mendelssohn, Hiller was nevertheless largely forgotten less than twenty years after his death as musical fashion changed. The Second Concerto is a genuine forgotten masterpiece, and Hyperion has been looking for the right opportunity to record it for many years. The First and Third concertos are both first recordings, and indeed the Third was never published. A combination of the appealing and the unknown makes this a classic RPC disc. 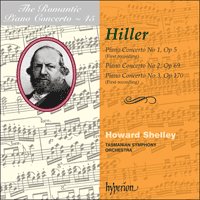 Howard Shelley is a veteran of the Romantic Piano Concerto series. He conducts the Tasmanian Symphony Orchestra here from the piano. Anyone who is accorded such recognition, who could claim close friendships with the likes of Mendelssohn, Cherubini, Rossini, Berlioz, Liszt and Meyerbeer, cannot have been a normal human being or an insignificant composer. And yet it cannot be denied that Ferdinand Hiller, less than twenty years after his death, has been largely forgotten—he, who possessed so many talents, a single one of which would, surely, have sufficed to guarantee him lasting fame’ (Carl Reinecke, Gedenkblätter an berühmte Musiker, 1900). Indeed, Ferdinand Hiller possessed talent in abundance. He began his career as a musical prodigy and later became a celebrated piano virtuoso, successful composer, conductor, writer on music and impresario. With his social skills, his artistic versatility and organizational flair, he can be compared with Felix Mendelssohn as one of the most imposing musical personalities of the nineteenth century. Born on 24 October 1811 in Frankfurt am Main, the son of the prosperous Jewish businessman Justus Hiller and his wife Regine (née Sichel), Ferdinand Hiller grew up in a time of cultural change, during which his home town attracted numerous artists, writers and musicians. His parents were quick to encourage his musical talent. He received violin, harmony and counterpoint lessons, and made his successful concert debut at the age of ten. In 1825 he moved to Weimar where he continued his musical education with Mozart’s pupil Johann Nepomuk Hummel, then considered to be one of Europe’s greatest composers and pianists. The next milestone in Ferdinand Hiller’s career was the period he spent in Paris from October 1828. Letters of recommendation gained him entry into the great salons, where he quickly got to know musicians and writers. He became Cherubini’s protégé, met Meyerbeer, Rossini, Kalkbrenner and Berlioz, and enjoyed a close friendship with Liszt and Chopin. Financially independent, he was able to devote himself exclusively to music—composing, teaching and giving concerts. At the end of April 1836 Hiller returned to Frankfurt, and for a year assumed the Directorship of the Cäcilienverein; the next five years were spent abroad, mostly in Italy. After the failure of his opera Romilde in Milan he enjoyed success in Leipzig with his oratorio The Destruction of Jerusalem Op 24. It was also in Leipzig that Hiller, as Mendelssohn’s deputy, conducted the 1843 Gewandhaus concerts, and in the following year he and his young wife settled in Dresden. His plan, as conductor, to create a series of subscription concerts failed in the same way as his two operas Traum in der Christnacht (1845) and Konradin (1847). In 1847 Hiller accepted the post of Kapellmeister in Düsseldorf, where in the years to come he would play an active role in the city’s politics. In 1850 he was appointed as Kapellmeister in Cologne, which from then on became the centre of his artistic activity. He founded an orchestra which, under his influence, acquired a considerable reputation. He also worked tirelessly for the Lower Rhine Music Festival, and as Director continued to increase the renown of the Cologne Conservatoire. His numerous articles concentrate mostly on musical life and personalities. As a pianist he gave concerts throughout Europe. In the winter of 1852 Hiller went to Paris as chief conductor at the Italian Opera, but in the second half of his musical life he remained loyal to Cologne, where he died on 11 May 1885. Ferdinand Hiller’s artistic legacy, which even today has not been thoroughly researched, was one of the most extensive and comprehensive of the era. Apart from his numerous writings, he left behind a musical output of more than two hundred works. Hiller regarded himself principally as a composer, and his most celebrated pupils include Max Bruch, Friedrich Gernsheim and Engelbert Humperdinck. As a staunch conservative in musical matters, he regarded the New German School increasingly critically. He deliberately pitted his own works against such modern developments. Praised in his youth as a most promising composer, he found it increasingly difficult to make his mark. He was always highly praised, however, as a pianist of perfect technique. He played his own compositions with success, but was also considered to be an excellent and authoritative interpreter of Bach, Mozart and Beethoven. A substantial portion of Hiller’s output was for the piano, and of all the works for solo piano it was his Rhythmical Studies Op 52 and his Ghazèles Op 54 that, because of their innovatory elements, aroused the greatest interest. He also composed chamber music with piano, and several works for piano and orchestra, which Hiller, like many composer-pianists, wrote to be included in his own repertoire. The three piano concertos (Opp 5, 69 and 170) and his Konzertstück, Op 113, were composed at various times throughout his career. The Piano Concerto No 1 in F minor Op 5 was composed during Hiller’s Paris period between 1829 and 1831, and it is dedicated to the piano virtuoso Ignaz Moscheles. Although the concerto, with its exceptionally brilliant solo part, was designed to give Hiller the opportunity to display his virtuosity, the ambitious composer also took great care to write a highly musical piece. The work was first performed at the Paris Conservatoire on 4 December 1831 at a concert in which his Symphony No 2 in A minor and a Faust Overture were also performed. In the Allegro moderato, the orchestra announces the strikingly rhythmic first subject. After a lyrical second subject the piano enters with a dramatic fortissimo. The first subject leads to another pianistically conceived theme, which, with its ornamentations, resembles Chopin. Hiller’s first attempt at writing a concerto, his first essay in composing for a large orchestra, introduces us to his characteristic use of a twofold exposition, whereby he displays his ability to handle appropriately the two different sound worlds of the piano and orchestra. Before the piano introduces the second subject, there is an extended virtuosic passage in which the pianist can display his technical abilities. With the return of the first subject comes a transitional section, played mostly by the orchestra, which dispenses for the most part with any thematic development. The piano eventually introduces the reprise, which takes up the second subject. As in the coda, the piano part is dominated by ornamentation. In the Adagio the orchestra introduces the piano, which enters ad libitum and almost fantasy-like. A dialogue between piano and orchestra leads to a more lyrical, dance-like section, before a poco agitato rhythmical accompaniment provides contrast. Material from the first two sections closes the movement. The rondo finale, Allegro moderato e con grazia, with its loose structure, resembles an extended sonata rondo. The piano enters alone with the brilliant opening theme (dolce); the lyrical second subject is also introduced by the piano in writing that is markedly pianistic in style. This is followed by a sort of transitional section, and also a repeat of the second subject in the tonic. There is opportunity for the pianist to display his virtuosity in no fewer than five sections. The Piano Concerto No 2 in F sharp minor Op 69 is considered to be Hiller’s most successful contribution to the genre. The work, which is dedicated to Wilhelmin Szarvady, was composed around the time Hiller moved from Frankfurt to Leipzig in the autumn of 1843. Despite the lack of rehearsal time, the premiere in the Gewandhaus on 26 October 1843 was a success. In this concerto Hiller clearly moved away from the Parisian virtuoso style: compared to his earlier concerto Op 5 this work finds a different solution to the ‘concerto problem’. All three movements are, in their form and development, conceived in a much more multi-layered manner, with piano and orchestra dovetailing more frequently. The first movement, Moderato, ma con energia e con fuoco, begins unconventionally. Instead of an orchestral exposition, the piano opens the movement and announces the energetic first subject. After a lyrical second subject, an unaccompanied passage for piano merges into the orchestral exposition. After the first subject, a second march-like theme is introduced, with the piano adding its own lyrical and ornamented theme. A fortissimo chord, played by the piano and strings, marks the beginning of a short development section. There is then a reprise of the first subject which, after a few bars, merges into a cadenza for the piano soloist. The thematic material is suffused with embellishments. A final orchestral tutti brings about a synthesis of the first theme and the second orchestral theme. The piano, playing quasi fantasia and ad libitum, leads directly into the slow movement. The protagonist in the Andante espressivo is clearly the soloist. In a chord-dominated movement the piano announces several lyrical motifs with frequently modulating harmonies. After a return to the first subject there is a highly embellished recitative-like passage in which the soloist plays several bars above string tremolandos and chords played by the wind section. The first subject returns in the orchestra, after which the piano brings the movement to an end with three unaccompanied pianissimo chords. Viewed formally the finale, Allegro con fuoco, is a combination of sonata structure and development. The orchestra begins the movement, after which the soloist announces the first subject with a distinctive octave leap. The lyrical second subject is also introduced by the piano, accompanied by low-lying pizzicato strings. From now on the themes, or snatches of themes, alternate in various keys, interrupted by pianistic flourishes. All three of Ferdinand Hiller’s piano concertos are fine and demanding examples of the genre. As an ambitious composer with a thorough classical training, he never allowed these works to sink to a trivial or superficial level. Although Op 5 boasts a very brilliant piano part, it is far from being mere ‘soulless, empty virtuosity’ (Friedrich Wieck, Clavier und Gesang, 1853). When critics reviewed this early concerto in 1839, they found—even in a work written for Hiller’s own sparkling repertoire during his Parisian period—that there was more thought than virtuosity. All three works endorse Hiller’s views of ‘a most dignified striving’ for ‘pure taste’ (Hiller, Aus dem Tonleben unserer Zeit) that he thought he could detect in musical life. Even if an increasingly conservative tendency can be observed in the composition of his concertos, it cannot be denied that all three works manifest—with regard to form, structure, instrumentation and treatment of the solo instrument—an original and ambitious solution to the ‘concerto problem’. Hiller was perhaps never the genius that Robert Schumann described in his Neue Zeitschrift für Musik, in which he describes Hiller as being able to show us ‘how to combine orchestra and piano in brilliant fashion’, so that both soloist and orchestra might both fulfil their great and multifarious potential to the best of their abilities. Nonetheless, there can be no doubt that his works for piano and orchestra represent a musically remarkable and valuable contribution to the genre in the nineteenth century. Quiconque se voit accorder une telle reconnaissance et a pu se dire l’ami proche de gens comme Mendelssohn, Cherubini, Rossini, Berlioz, Liszt et Meyerbeer ne peut avoir été un être humain ordinaire ou un compositeur insignificant. Pourtant, il est indéniable que, moins de vingt ans après sa mort, Ferdinand Hiller est largement tombé dans l’oubli—lui qui avait tant de talents, dont un seul eût dû suffire à lui garantir une renommée durable» (Carl Reinecke, Gedenkblätter an berühmte Musiker, 1900). De fait, Ferdinand Hiller était bourré de talent: enfant prodige, il devint un célèbre pianiste virtuose et fut tout à la fois compositeur à succès, chef d’orchestre, musicographe et impresario. Son aisance mondaine, sa polyvalence artistique et son sens de l’organisation en firent l’une des personnalités musicales les plus marquantes du XIXe siècle, l’égal de Felix Mendelssohn. Fils du prospère homme d’affaires juif Justus Hiller et de son épouse Regine (née Sichel), Ferdinand Hiller naquit à Francfort-sur-le-Main le 24 octobre 1811 et grandit en plein bouleversement culturel, à une époque où sa ville natale attirait de nombreux artistes, écrivains et musiciens. Ses parents furent prompts à encourager son don pour la musique. Il reçut des leçons de violon, d’harmonie et de contrepoint et fit de brillants débuts de concertiste à l’âge de dix ans. En 1825, il s’installa à Weimar où il poursuivit sa formation auprès d’un élève de Mozart, Johann Nepomuk Hummel, alors considéré comme l’un des plus grands compositeurs-pianistes européens. À partir d’octobre 1828, Paris marqua une nouvelle étape dans la carrière de Ferdinand Hiller, à qui des lettres de recommendation permirent d’entrer dans les grands salons, où il fit rapidement la connaissance de musiciens et d’écrivains. Il devint le protégé de Cherubini, rencontra Meyerbeer, Rossini, Kalkbrenner et Berlioz et goûta la joie d’être l’ami intime de Liszt et de Chopin. Financièrement indépendant, il put se consacrer à la musique—composition, enseignement et concerts. À la fin d’avril 1836, Hiller rentra à Francfort, où il dirigea la Cäcilienverein pendant un an, avant de passer cinq années à l’étranger, surtout en Italie. Après l’échec milanais de son opéra Romilda, il connut le succès à Leipzig avec son oratorio Die Zerstörung Jerusalems, op. 24. Assistant de Mendelssohn, ce fut dans cette même ville qu’il dirigea les concerts du Gewandhaus; l’année suivante, il emménagea avec sa jeune épouse à Dresde. Son projet de créer et de diriger des concerts par abonnement tourna court, tout comme échouèrent ses deux opéras Der Traum in der Christnacht (1845) et Konradin (1847). En 1847, Hiller accepta le poste de Kapellmeister à Düsseldorf, où il allait jouer un rôle actif dans la politique municipale. En 1850, il fut nommé Kapellmeister à Cologne, qui devint alors le centre de son activité artistique. Il fonda un orchestre qui, sous sa houlette, acquit une immense réputation. En outre, il travailla sans relâche pour le Festival de musique du Bas-Rhin et prit la direction du Conservatoire de Cologne, dont il continua d’accroître la renommée. Enfin, il rédigea de nombreux articles, essentiellement centrés sur la vie et les personnalités musicales, et donna des récitals de piano dans toute l’Europe. À l’hiver de 1852, il se rendit à Paris pour être chef permanent du Théâtre-Italien. Puis il rentra à Cologne, ville à laquelle il demeura fidèle durant toute la seconde moitié de sa carrière et où il mourut le 11 mai 1885. L’héritage artistique de Ferdinand Hiller n’a encore fait l’objet d’aucune étude approfondie, mais c’est l’un des plus étendus et des plus complets de son temps, avec de nombreux écrits et plus de deux cents œuvres musicales. Hiller se voyait avant tout comme un compositeur et Max Bruch, Friedrich Gernsheim et Engelbert Humperdinck comptent parmi ses élèves les plus illustres. Farouchement conservateur en matière de musique, il considéra la nouvelle école allemande d’un œil toujours plus critique et dressa délibérément ses œuvres contre ces développements modernes. Tenu, dans sa jeunesse, pour un compositeur fort prometteur, il eut de plus en plus de mal à s’imposer, même si l’on ne cessa jamais de louer sa parfaite technique pianistique. Il joua ses compositions avec succès, mais fit aussi autorité avec ses interprétations, jugées excellentes, de Bach, Mozart et Beethoven. De toutes ses pièces pour piano solo—un instrument auquel il destina l’essentiel de son œuvre—, ce furent ses Études rythmiques, op. 52 et ses Ghazèles, op. 54 qui, par leurs éléments novateurs, suscitèrent le plus d’intérêt. Hiller composa aussi de la musique de chambre avec piano et plusieurs ouvrages pour piano et orchestre—des pages que, comme maints compositeurs, il écrivit à seule fin de les inclure dans son propre répertoire. Ses trois concertos pour piano (opp. 5, 69 et 170) et son Konzertstück, op. 113 virent le jour à des moments différents de sa carrière. Le Concerto pour piano no 1 en fa mineur op. 5 date de la période parisienne de Hiller (1829–1831) et est dédié au pianiste virtuose Ignaz Moscheles. Bien qu’ayant conçu ces pages pour faire valoir sa virtuosité (comme l’atteste la partie solo, exceptionnellement brillante), l’ambitieux Hiller prit grand soin d’écrire une pièce fort musicale. Cette dernière fut créée au Conservatoire de Paris, le 4 décembre 1831, lors d’un concert proposant deux autres œuvres du compositeur: la Symphonie no 2 en la mineur et une Ouverture Faust. Dans l’Allegro moderato, l’orchestre annonce le premier sujet, remarquablement rythmique. Passé un second sujet lyrique, le piano entre avec un théâtral fortissimo. Le premier sujet débouche sur un nouveau thème de conception pianistique, que ses ornementations font ressembler à du Chopin. Cette première tentative de concerto, ce premier essai de composition pour grand orchestre nous dévoile l’habitude que prendra Hiller de recourir à une exposition double pour montrer son aptitude à traiter avec pertinence les univers tonaux pianistique et orchestral. Avant que le piano n’introduise un second sujet, un passage virtuose permet au pianiste de laisser éclater ses capacités techniques. Avec le retour du premier sujet survient une section de transition, jouée essentiellement par l’orchestre, qui se passe, la plupart du temps, de développement thématique. Enfin, le piano introduit la reprise, qui redonne le second sujet. Comme dans la coda, la partie pianistique est dominée par l’ornementation. Dans l’Adagio, l’orchestre introduit le piano, qui entre ad libitum et presque en manière de fantaisie. Un dialogue entre le piano et l’orchestre mène à une section davantage lyrique, dansante, que vient contraster un accompagnement rythmique poco agitato. Le matériau des premières sections clôt le mouvement. Avec sa structure relâchée, le finale en rondo, Allegro moderato e con grazia, ressemble à un long rondo de sonate. Le piano entre seul, avec le brillant thème d’ouverture (dolce); le second sujet lyrique est également introduit par le piano, dans une écriture au style ostensiblement pianistique. S’ensuivent une sorte de section de transition et une répétition du second sujet à la tonique. Le pianiste peut montrer sa virtuosité dans pas moins de cinq sections. De toutes les contributions de Hiller au genre concerto, le Concerto pour piano no 2 en fa dièse mineur op. 69 est considéré comme la plus réussie. Dédié à Wilhelmin Szarvady, il fut composé lorsque Hiller quitta Francfort pour Leipzig, à l’automne de 1843. Malgré l’absence de répétitions, la première, au Gewandhaus (26 octobre 1843), fut un succès. Dans cette œuvre, Hiller se détache à l’évidence du style virtuose parisien et résout le «problème du concerto» d’une façon qui n’est pas celle de l’op. 5. Ici, les trois mouvements sont, dans leur forme comme dans leur développement, conçus d’une manière bien plus «multi-couches», le piano et l’orchestre s’imbriquant plus souvent. L’ouverture du premier mouvement, Moderato, ma con energia e con fuoco, est peu conventionnelle: l’exposition orchestrale s’y voit remplacée par le piano, qui amorce le mouvement et annonce l’énergique premier sujet. Après un second sujet lyrique, un second thème alla marcia est introduit, avec le piano qui ajoute son propre thème lyrique et orné. Un accord fortissimo, au piano et aux cordes, marque le début d’une courte section de développement. Arrive alors une reprise du premier sujet qui, passé quelques mesures, se fond dans une cadenza destinée au pianiste. Le matériau thématique est baigné de broderies. Un tutti orchestral final amène un synthèse du premier thème et du second thème orchestral. Le piano, jouant ad libitum et quasi fantasia, conduit directement au mouvement lent. Le protagoniste de l’Andante espressivo est, sans contredit, le soliste. Dans un mouvement dominé par les accords, le piano annonce plusieurs motifs lyriques, aux harmonies souvent modulantes. Après un retour au premier sujet, un passage en style récitatif, orné à souhait, voit le soliste exécuter plusieurs mesures par-dessus des tremolandos aux cordes et des accords joués par les vents. Le premier sujet revient dans l’orchestre, puis le piano clôt le mouvement sur trois accords pianissimo sans accompagnement. D’un point de vue formel, le finale, Allegro con fuoco, combine développement et structure de sonate. L’orchestre commence le mouvement, avant que le soliste n’annonce le premier sujet avec un distinctif saut d’octave. De même, le second sujet lyrique est introduit par le piano, accompagné des cordes graves en pizzicato. Dès lors, les thèmes, ou les bribes des thèmes, alternent dans différentes tonalités, interrompus par des fioritures pianistiques. Ces trois œuvres sont de beaux et difficiles concertos pour piano que Hiller, en compositeur ambitieux doté d’une solide formation classique, ne laissa jamais sombrer dans la trivialité ou la superficialité. Bien que pouvant se targuer d’une brillantissime partie de piano, l’op. 5 est ainsi tout sauf d’une «virtuosité sans âme, vide» (Friedrich Wieck, Clavier und Gesang, 1853). Déjà en 1839, lorsqu’ils firent le compte rendu de ce concerto de jeunesse, les critiques y perçurent plus de réflexion que de virtuosité, même pour une œuvre destinée au répertoire brillant de la période parisienne de Hiller. Ces trois compositions corroborent l’idée d’un Hiller «s’efforçant à un goût pur, avec la plus grande dignité» (Hiller, Aus dem Tonleben unserer Zeit)—un goût qu’il pensait pouvoir déceler dans la vie musicale. Malgré une tendance de plus en plus conservatrice, ces trois concertos constituent indéniablement (pour ce qui est de la forme, de la structure, de l’instrumentation et du traitement de l’instrument solo) une solution originale et ambitieuse au «problème du concerto». Hiller ne fut peut-être jamais le génie décrit par Robert Schumann dans sa Neue Zeitschrift für Musik—selon ce dernier, il nous montre «comment brillamment combiner l’orchestre et le piano», en sorte que chacun exploite au mieux son potentiel immense et varié—mais nul doute que, par ces œuvres, il apporta une remarquable et précieuse contribution au concerto du XIXe siècle. Derjenige, dem solche Anerkennung […] zuteil wurde, der sich überdies der Freundschaft eines Mendelssohn, Cherubini, Rossini, Berlioz, Liszt und Meyerbeer rühmen und erfreuen durfte, kann unmöglich ein gewöhnlicher Mensch und unbedeutender Musiker gewesen sein. Und dennoch ist nicht in Abrede zu stellen, dass Ferdinand Hiller schon jetzt, noch nicht 20 Jahre nach seinem Tode, ziemlich vergessen ist—er, der so viele Talente besass, dass man hätte glauben sollen, der Besitz eines einzigen derselben würde genügen, ihm auf längere Zeit hinaus den Nachruhm zu sichern“ (Carl Reinecke, Gedenkblätter an berühmte Musiker, 1900). Talente besaß Ferdinand Hiller wahrlich in großer Zahl. Er begann seine Laufbahn als musikalisches Wunderkind, später avancierte er zum gefeierten Klaviervirtuosen, erfolgreichen Komponisten, Dirigenten, Musikschriftsteller und Musikorganisator. Von seiner gesellschaftlichen Gewandtheit, seiner künstlerischen Vielseitigkeit und seinem Organisationstalent her mit Felix Mendelssohn-Bartholdy vergleichbar, ist Hiller sicherlich eine der repräsentativsten Musikerpersönlichkeiten des 19. Jahrhunderts. Am 24. Oktober 1811 in Frankfurt/Main als Sohn des wohlhabenden jüdischen Kaufmanns Justus Hiller (zuvor Isaac Hildesheim) und dessen Frau Regine (geb. Sichel) geboren, wuchs Ferdinand Hiller in einer Zeit des kulturellen Aufbruchs auf, in der seine Heimatstadt zahlreiche Künstler anzog. Die Eltern förderten früh sein musikalisches Talent. Er erhielt Unterricht in Violine, Klavier, Harmonielehre und Kontrapunkt und gab zehnjährig erfolgreich sein Konzertdebüt. 1825 siedelte er zur weiteren Ausbildung nach Weimar zum Mozartschüler Johann Nepomuk Hummel über, der damals als einer der größten Komponisten und Pianisten Europas galt. Der nächste Meilenstein in Ferdinand Hillers Karriere war sein Parisaufenthalt ab Oktober 1828. Durch Empfehlungen verkehrte er in den großen Salons und konnte rasch Kontakte zu Musikern und Schriftstellern knüpfen. Er wurde von Luigi Cherubini protegiert, schloss Bekanntschaft mit Meyerbeer, Rossini, Kalkbrenner und Berlioz, eine enge Freundschaft verband ihn mit Liszt und Chopin. Finanziell unabhängig konnte er sich in seiner Pariser Zeit ausschließlich der Musik widmen. Er komponierte, unterrichtete und konzertierte. Ende April 1836 kehrte Hiller nach Frankfurt zurück und übernahm für ein Jahr die Leitung des Cäcilienvereins. Danach lebte er fünf Jahre überwiegend in Italien. Während seine Oper Romilda in Mailand durchfiel, wurde in Leipzig sein Oratorium Die Zerstörung Jerusalems, op. 24, ein Erfolg. 1843 dirigierte Hiller dort als Mendelssohns Stellvertreter die Gewandhauskonzerte, im folgenden Jahr ließen er und seine junge Frau sich in Dresden nieder. Das Vorhaben, als Kapellmeister Abonnementskonzerte ins Leben zu rufen, war allerdings so wenig erfolgreich wie die Aufführungen seiner beiden Opern Traum in der Christnacht (1845) und Konradin (1847). 1847 nahm Hiller eine Stelle als Städtischer Kapellmeister in Düsseldorf an, wo er sich in den folgenden Jahren auch politisch betätigte. 1850 wurde er nach Köln auf die Stelle des Städtischen Kapellmeisters berufen und fand dort sein endgültiges Wirkungsfeld. Er gründete ein Orchester und verhalf ihm in den Gürzenich-Konzerten zu weit ausstrahlendem Ruhm. Zudem engagierte er sich für die Niederrheinischen Musikfeste und trieb als Direktor des Kölner Konservatoriums dessen Aufstieg voran. In seinen Schriften und Artikeln beschäftigte er sich mit dem Musikleben und dessen Persönlichkeiten. Als Pianist konzertierte er in ganz Europa. Im Winter 1852 wurde Hiller als Erster Kapellmeister an die italienische Oper in Paris berufen, doch blieb er in seiner zweiten Lebenshälfte Köln verbunden. Er starb dort am 11. Mai 1885. Ferdinand Hillers künstlerisches Erbe gehört zu den umfangreichsten und umfassendsten seiner Zeit und ist bis heute nicht vollständig erschlossen. Neben den zahlreichen schriftstellerischen Arbeiten hinterließ er ein musikalisches Oeuvre von 200 Opuszahlen. Zeit seines Lebens sah sich Hiller in erster Linie als Komponist. Zu seinen bekanntesten Schülern zählten Max Bruch, Friedrich Gernsheim und Engelbert Humperdinck. Als überzeugter Anhänger der konservativen Richtung betrachtete er die „Neudeutschen“ mit zunehmend kritischer Einstellung. Seine Werke stellte er bewusst gegen diese Entwicklungen der Zeit. In seiner Jugend noch als viel versprechendes Kompositionstalent gepriesen, konnte er sich immer schwerer durchsetzen. Als Pianist hingegen war der perfekt ausgebildete Techniker Hiller stets hoch geschätzt. Er trat erfolgreich mit eigenen Kompositionen auf, galt jedoch auch als ausgezeichneter Interpret von Bach, Mozart und Beethoven und setzte sich maßgeblich für die Aufführung ihrer Werke ein. Er war überdies einer der letzten Repräsentanten konzertmäßiger Improvisation. In Hillers Oeuvre nehmen die Werke mit Klavier einen wichtigen Platz ein. Von den Stücken für Klavier solo stießen die Rhythmischen Studien op. 52 und die Ghazèles op. 54 wegen ihrer Innovation auf größtes Interesse. Neben Kammermusik mit Klavier liegen auch mehrere Werke für Klavier und Orchester vor, die Hiller wie viele der „Virtuosen-Komponisten“ vorwiegend für sein eigenes Repertoire schrieb. Opuszahlen tragen die drei Klavierkonzerte op. 5, op. 69 und op. 170 sowie das Konzertstück op. 113. Diese vier Werke entstanden über die gesamte Schaffenszeit verteilt. Das Concerto pour le piano forte avec accompagnement d’Orchestre, f-Moll op. 5 stammt aus Hillers Pariser Jahren. Er komponierte es zwischen 1829 und 1831 und widmete es dem Klaviervirtuosen Ignaz Moscheles. Obgleich das Konzert mit seinem äußerst brillanten Klavierpart darauf angelegt ist, den Pianisten Hiller glänzen zu lassen, sorgt der ambitionierte Komponist Hiller für musikalischen Anspruch. Das Werk wurde bei seinem erfolgreichen zweiten Konzert am Pariser Conservatoire am 4. Dezember 1831 zusammen mit seiner zweiten Sinfonie in a-Moll und einer Ouvertüre zu Faust uraufgeführt. Im Allegro moderato exponiert das Orchester unisono das erste, rhythmisch markante Thema. Nach einem gesanglichen Seitenthema setzt das Klavier effektvoll im fortissimo ein. Es stellt seinerseits das erste Thema sowie ein eigenes, pianistisch gestaltetes Seitenthema vor, das mit seiner Ornamentik Anklänge an Chopins Klavierstil zeigt. Hillers Konzerterstling, zugleich die erste Komposition für große Orchesterbesetzung, weist die typische doppelte Exposition auf, in welcher der Komponist gleich einer „kompositorischen Visitenkarte“ seine Fähigkeit zeigt, mit verschiedenen Klangkörpern angemessen umgehen zu können. Bevor das Klavier das zweite Thema einführt, beginnt eine erste ausgedehnte Spielepisode, in welcher der Solist seine technischen Fähigkeiten präsentieren kann. Mit der Wiederkehr des ersten Themenmotivs beginnt ein Durchführungsteil, der vor allem vom Orchester gestaltet wird und weitgehend auf motivisch-thematische Arbeit verzichtet. Das Klavier leitet schließlich zur Reprise über, in der das zweite Thema aufgenommen wird. Der Klavierpart wird hier wie auch in der Coda von Figurationen dominiert. Im Adagio bereitet das Orchester den Einsatz des Klaviersolos vor, das quasi phantasierend ad libitum einsetzt. Ein Dialog zwischen den beiden Klangkörpern geht in einen von tänzerischen Klaviermotiven dominierten Teil über. Einen Kontrast bildet die folgende Sechzehntelbewegung im Orchester, später im Klavier, bevor Material aus den ersten beiden Abschnitten wiederkehrt. Das Rondo, Allegro moderato e con grazia gleicht mit seinem locker gefügten Satz formal einem erweiterten Sonatenrondo. Das Klavier beginnt solo mit dem brillanten ersten Motiv der Themengruppe (dolce). Auch die lyrische zweite Themengruppe wird vom Klavier vorgestellt, wobei der Satz ausgesprochen pianistisch gestaltet ist. Es folgen eine Art Durchführungsteil sowie eine Reprise mit dem zweiten Thema in der Tonika. In insgesamt fünf Spielepisoden des Klaviers schafft sich die Virtuosität Raum zur Entfaltung. Das zweite Klavierkonzert, Concert für das Pianoforte mit Begleitung des Orchesters, fis-Moll op. 69 gilt als Hillers erfolgreichster Beitrag zur Gattungsgeschichte. Die Entstehung des Wilhelmin Szarvady gewidmeten Werks fällt in die Zeit seines Umzug von Frankfurt nach Leipzig im Herbst 1843. Trotz der knappen Probenzeit wurde die Uraufführung im Gewandhaus am 26. Oktober 1843 ein Erfolg. Mit dem zweiten Klavierkonzert hat sich Hiller deutlich von dem Pariser Virtuosenstil wegbewegt. Im Vergleich mit op. 5 zeigt das Werk eine andere Lösung des „Konzertproblems“. Alle drei Sätze sind von Anlage und Ausgestaltung vielschichtiger gestaltet, Klavier und Orchester sind zunehmend miteinander verknüpft. Der erste Satz Moderato, ma con energia e con fuoco beginnt unkonventionell. Anstelle einer Orchesterexposition eröffnet das Klavier den Satz und exponiert das energisch beginnende erste Thema. Nach einem kantablen Seitenthema leitet ein erster, unbegleiteter Figurationsteil zur Orchesterexposition über. Neben dem ersten wird später das zweite, marschartige Thema eingeführt, das Klavier fügt ein eigenes lyrisches, ornamentales Thema hinzu. Ein fortissimo-Akkord in Streichern und Klavier markiert den Beginn eines kurzen Durchführungsteils. Mit dem ersten Thema setzt die Reprise ein, die nach wenigen Takten in eine Solokadenz des Klaviers übergeht. Von Figurationen durchsetzt wird thematisches Material aufgegriffen. Ein Schluss-Tutti des Orchesters bringt eine Synthese von erstem Thema und zweitem Orchesterthema. Das Klavier leitet quasi fantasierend (ad libitum) zum langsamen Satz über. Protagonist im Andante espressivo ist klar das Klavier. In einem akkordisch angelegten Satz exponiert es mehrere kantable Motive mit häufig modulierender Harmonik. Eine Wiederkehr der ersten Motivgruppe mündet in einen rezitativischen Teil, in dem der Solist als „Sänger am Instrument“ einige Takte über Streichertremoli und Bläserakkorden deklamiert. Nach der Aufnahme des ersten Motivs lässt das Klavier den Satz mit drei unbegleiteten Akkorden im pianissimo ausklingen. Formal gesehen ist das Finale, Allegro con fuoco eine Kombination von Sonatensatz und Reihungsform. Das Orchester leitet den Satz ein und führt zur Soloexposition des ersten Themas mit dem markanten Oktavsprung hin. Auch das zweite, kantable Thema wird vom Klavier vorgestellt und von den tiefen Streichern pizzicato begleitet. Von nun an erklingen die Themen bzw. Thementeile abwechselnd in unterschiedlichen Tonarten, unterbrochen durch figurale Abschnitte des Klaviers. Ferdinand Hiller setzt sich in allen drei Klavierkonzerten auf einer musikalisch anspruchsvollen Ebene mit der Gattung auseinander. Als ambitionierter Komponist mit einer gründlichen, klassischen Ausbildung ließ er auch diese Werke nie in Trivialität und Oberflächlichkeit absinken. Obwohl besonders op. 5 einen sehr brillanten Klavierpart aufweist, ist auch dieses Werk weit davon entfernt, nur „seelenlose, leere Fingerfertigkeit“ (Friedrich Wieck, Clavier und Gesang, 1853) zu präsentieren. Selbst an diesem ersten Konzert, das er während seiner Pariser Virtuosenjahre für sein Repertoire schrieb, lobten die Kritiker 1839, dass der Gedanke über die technischen Mittel herrsche. Alle drei Werke korrespondieren mit Hillers Äußerungen über das „gediegenste Streben“ nach „geläutertem Geschmack“ (Hiller, Aus dem Tonleben unserer Zeit, 1868), das er im Musikleben zu erkennen glaubte. Auch wenn in der kompositorischen Entwicklung seiner Konzerte eine zunehmend konservative Ausrichtung zu beobachten ist, lässt sich festhalten, dass ihm mit allen drei Kompositionen in Bezug auf Satzform, Satzstruktur, Instrumentation, Satztechnik sowie Behandlung des Soloinstruments eine originelle und ambitionierte Lösung des „Konzertproblems“ gelang. Hiller war vielleicht nie der Genius, der Robert Schumanns 1839 in der Neuen Zeitschrift für Musik geäußerte Hoffnungen auf denjenigen erfüllen konnte, „der uns in glänzender Weise zeigt, wie das Orchester [so] mit dem Clavier zu verbinden sei“, dass sowohl Solist als auch Orchester ihren vielfältigen Reichtum an Möglichkeiten ausschöpfen und sich bestmöglich entfalten können. Dennoch bilden seine Werke für Klavier und Orchester mit Sicherheit einen musikalisch bemerkenswerten und wertvollen Beitrag zur Gattung des Klavierkonzertes im 19. Jahrhundert.